If you've paid attention to my blog you know I occasionally rant and rave about things non-moto related. Usually it's about my dog (Trout) or something to do with LEO's or the Kilcullen Project (http://www.kilcullenproject.org/). 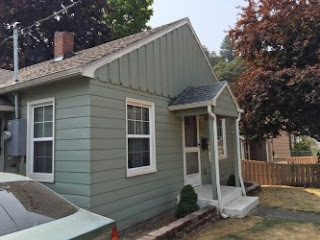 This time I'm ranting about the Kilcullen Project indirectly, but more specifically, about a little boy who's been through hell and is slowly working his way back. In the time I've known Riley he's been quiet and my attempts to steal a slight smile or even a smirk have fallen flat. He is a boy who appears to be fighting inner torment, almost afraid to smile for fear of breaking. There is one thing that I've seen bring a small glimmer to Riley's eyes. It is the University of Oregon Ducks. Once when driving down the Chris Kilcullen Memorial Highway someone pointed out Autzen Stadium and Riley was leaning over the seat looking through the trees just trying to get a glimpse. When the opportunity arose to get Riley a spot on the bowling team with a Duck player, it was too good to pass up. Mrs. Kilcullen made it happen. Riley showed up wearing a #24 jersey. He didn't say much and stood by his mom with a look of fear. Hands held in front, toying with each other. 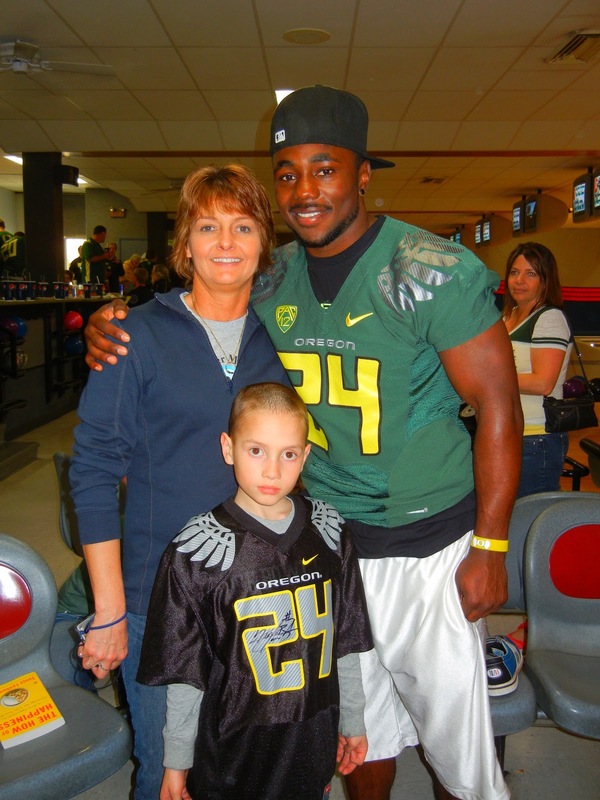 Riley's lane mate, Kenjon Barner (Ducks number 24) walked up with Riley each time he bowled, helping him and cheering him on. It was a gesture I'll never forget. Soon, Riley was running around getting his shirt signed by the players and although I still had not seen a full on smile, he was getting closer. After the pizza was eaten, the shirts were all signed, and Riley and his mom had won two pair of sunglasses, it was time to go. The final awards had been handed out and signed bowling pins went to the victors. As we were standing, gathering our t-shirts and saying our goodbyes, something wonderful happened. Callie, Chip Kelly's assistant, brought over a signed pin and told Riley she'd found an extra and wanted him to have it. Riley held it like he wasn't sure what was going on...and then he actually smiled. Riley smiled. Over a bowling pin. It was a beautiful moment. Then he carried that bowling pin around like it was worth a trillion dollars. It is tragic to hear of a fatality in the LEO family... and heartbreaking to see the children left behind, lost and confused as sadness hangs like a shadow. It is even worse when people think just because time has passed, life is better, life is grand, and that loss is no longer felt. I know at some point you have to stop being angry about the time you didn't get and rejoice about the time you had but I'm not sure how an 8 year old does that. Or how they even understand it. I think we, as a community, need to find a way to keep supporting families, to help when it is needed, and to remember that sometimes a small smile is the start of a healing process that will continue forever. 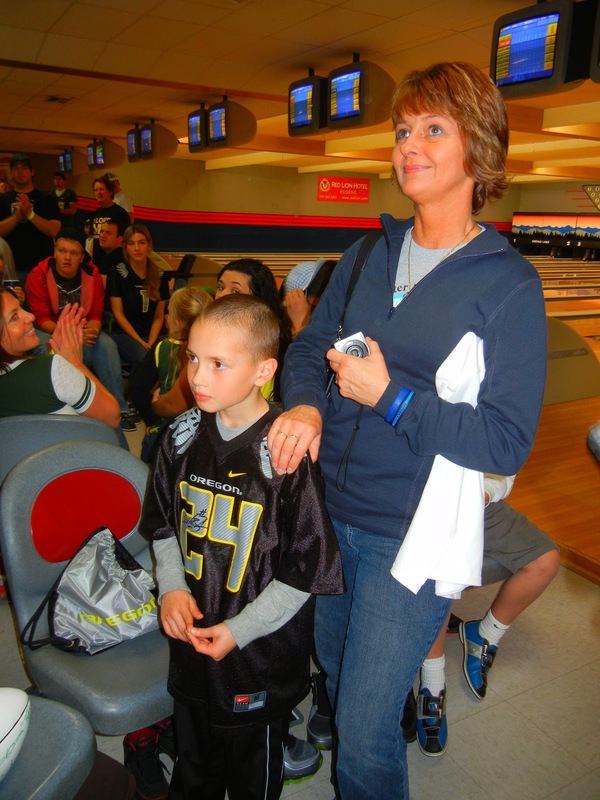 A HUGE THANK YOU to the University of Oregon, the entire football team, Callie, Coach Kelly, Emerald Lanes, Track Town Pizza, and the citizens who showed up to bowl, support, and laugh at the second Bowling with the Ducks. 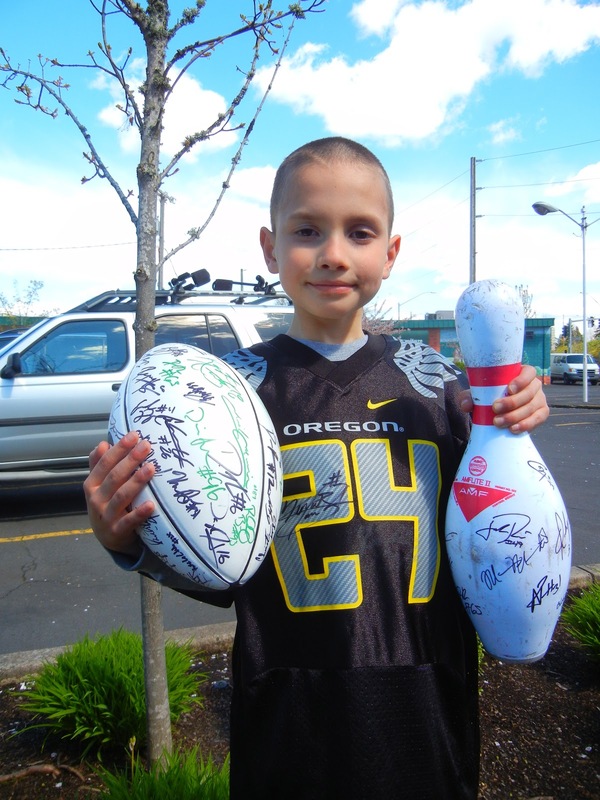 Each and every one of you helped support a great cause in the Officer Chris Kilcullen Memorial Scholarship and made a difference in the life of Riley Painter...who is probably sleeping with a bowling pin. Written with permission from Mrs. Ralph Painter. Great Story!! Makes me cry everytime I read it!